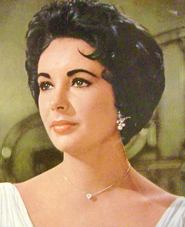 I read something very interesting this morning – Elizabeth Taylor may be headed down the aisle yet again! Aside from being a movie legend from a time when movie stars were glamorous and beautiful, she is best known for her penetrating violet eyes, her love of jewels (in particular very large diamonds and emeralds), and for her matrimonial exploits. If this ends up being true, this will be her NINETH wedding to EIGHT different husbands! 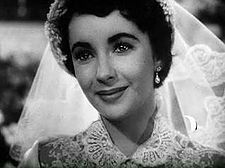 I adore Elizabeth Taylor and her movies. In fact, she is one of my two favorite legendary screen actresses, along with Katherine Hepburn. My beautiful Katie is named after them – Katie Elizabeth (which she only gets called when I need to get her attention and she’s on a mission)! Born Elizabeth Rosemond Taylor on February 27, 1932, she is one of the most recognizable faces and names from Hollywood’s heyday. But, this post is about the thought that she may actually be getting married for the nineth time at age 78. If you were to hyphenate all of her last names, her name would read as: Elizabeth Rosemond Taylor – Hilton – Wilding – Todd – Fisher – Burton – Burton – Warner – Fortensky. Whew! That’s a mouthful! If she marries her current love interest, you can add “Winters” to the hyphenated series! Apparently, she may be marrying Janet Jackson’s manager – Jason Winters, who is 49 years old. I wonder what the engagement ring will look like. Given her love of diamonds, it will need to be impressive to please her, but will likely never live up to some of her other well-known gems – like the 29-carat engagement ring presented to her by Michael Todd or the 69-carat one that Richard Burton gave her. According to Eddie Fisher, “A $50,000 diamond could keep her happy for approximately four days.” So, word to the wise, Mr. Winters, GO BIG! As for predictions for how long this will last? Well, she has been in poor health for many years and near death several times, so I wouldn’t take her age into consideration here – she’s a survivor! But a history of lengthy marriages really doesn’t exist. Her shortest marriage was to Nicky Hilton, which only lasted 8 months. Her longest was to Richard Burton, which lasted 10 years the first time and then a year and a half more a second time. Their’s was a tumultuous relationship and I think she lived for the adventures and passion (good and bad) that it brought her – I wouldn’t count on that kind of energy providing for another long span with anyone else. With the exception of her 13 month marriage to Michael Todd, which ended in his death in a plane crash, all her other marriages lasted an average of 5 years. So – given her track record, I give it no more than 5 years! ← Take me out to the ball game….